Daniel Murphy anti-gay: I’m glad the Mets lost the World Series. The Mets’ Anti-Gay Daniel Murphy Lost His Team the World Series. Good. 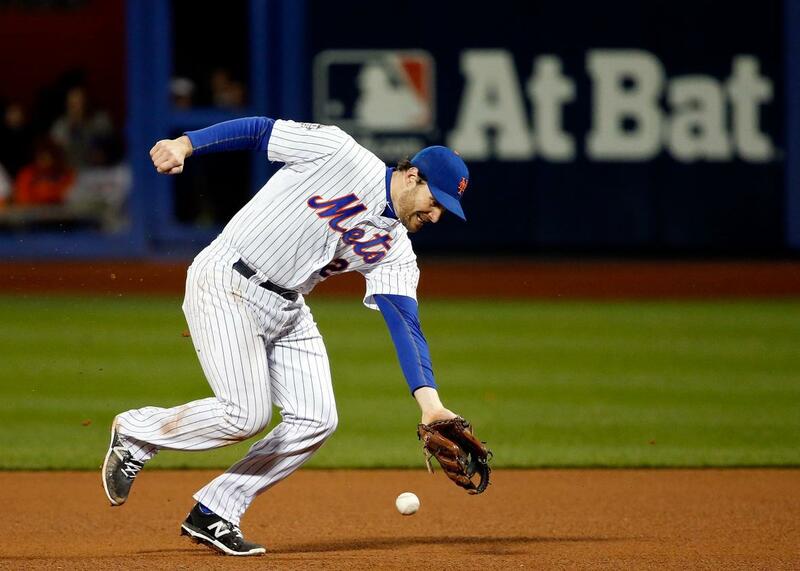 Daniel Murphy of the New York Mets fails to make a play on a ball hit by the Kansas City Royals’ Eric Hosmer in Game 4 of the 2015 World Series. The Kansas City Royals defeated the New York Mets 7–2 on Sunday night, winning the World Series in just five games. I am agnostic as to which team deserved to take the crown. But I’m thrilled that Mets (former) fan favorite and fomenter of homophobia Daniel Murphy played a crucial role in bringing his team to an embarrassing defeat. Maybe, as a Christian, that we haven’t been as articulate enough in describing what our actual stance is on homosexuality. We love the people. We disagree the lifestyle. That’s the way I would describe it for me. It’s the same way that there are aspects of my life that I’m trying to surrender to Christ in my own life. There’s a great deal of many things, like my pride. Of course, Murphy has every right to hold these beliefs, which earned him praise from such luminaries as the Westboro Baptist Church. He does not have a right to expand on them without discipline. Had an MLB player said something bigoted about a black or Jewish player, the league would have reprimanded him. Instead, it took no serious action against Murphy, effectively ratifying his views as reasonable and harmless. They are not. Every year, hundreds, perhaps thousands, of gay and bisexual kids kill themselves precisely because they are pummeled with homophobic ideas like these. Some overdose on their parents’ pills; some slit their wrists; some hang themselves or put bullets in their brain. LGB kids are between two and four times more likely to try to kill themselves than straight kids. Every episode of LGB victimization, including verbal harassment, increases the likelihood of self-harm 2.5 times on average, according to the CDC. When gay kids read comments like Murphy’s—and then see that the MLB deemed them acceptable—they’re liable to conclude that they really are twisted and aberrant, that society really won’t accept them for who they are. These toxic feelings could only be exacerbated by a cult of Murphy, a growing fan base that lauds him as the Mets’ savior. To see an anti-gay player be not just tolerated, but celebrated—even by those who would otherwise rebuke his prejudice—would be profoundly dispiriting. Even I, a fairly thick-skinned gay adult, was stunned by the celerity with which otherwise tolerant baseball fans forgave his anti-gay disparagements once he started hammering homers. Given these troubling facts, I must admit I cheered when Murphy committed a devastating, possibly legacy-blowing error in the eighth inning of Game 4. Murphy let a ball slide right past his glove, allowing the Royals to advance a runner home—tying the game, and giving the Royals a chance to perform their patented late-inning comeback routine. The astonishing bungle drew instant comparisons between Murphy and Bill Buckner, the player behind baseball’s most infamous fielding error. * According to one statistical analysis of Win Probability Added, Murphy’s was the second-most-costly error in World Series history—right behind Buckner’s. The Royals went on to win the game, then the World Series. Other Mets players share the blame, no doubt. But much of it falls squarely and resoundingly on Murphy’s shoulders. I sympathize with well-meaning Mets fans who watched their team collapse with all-too-familiar horror. But I’m delighted to see Murphy’s star come crashing down so publicly. Now a free agent, Murphy’s stock just plummeted, and his name will be whispered in disappointment rather than trumpeted with glee. Murphy’s horrifying performance, his downfall on the field, likely had nothing to do with his noxious personal prejudice. And yet, in some small way, it felt like justice. *Correction, Nov. 2: This post originally misstated that Bill Buckner was playing for the Mets when he committed his infamous error. He was playing against them.